UPDATE FRIDAY AFTERNOON: Two copies are left. I found a few remaining paperback review copies of Last Stop: Paris, which I’ll make available to anyone who would like to read it and post a review on Amazon. If you aren’t familiar with it, you can click the cover image in the sidebar to see the first 10%. The book is selling well, and the Amazon reviews have pretty much matched the rave it received from Kirkus Reviews. So far (on 19 reviews) it has a 4.8-star rating (of 5 maximum). I’m optimistic that it will eventually have as many reviews as Treasure of Saint-Lazare (145-ish), which is still selling well after three years on the market. It’s said that there’s no reason an ebook should go out of date, which makes sense when I look at Treasure. Email me at this address if you’d like one of the paperbacks. There’s something new on the horizon. In a short time (I know better than to promise a date) I’ll publish a short story telling the history behind the plot of Treasure and Last Stop. It will be titled Lauren, and will tell the romantic story of Eddie Grant’s courtship of his first wife Lauren during their college days in the ’80s. 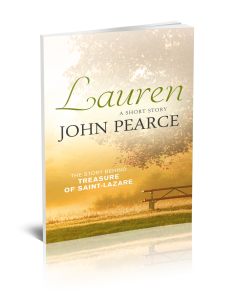 Lauren will be an ebook only, and I plan to offer it free to all my blog subscribers.